I was searching my hard drives and came across a big collection of 0RANGECHiCKEN releases I thought I deleted a loooong time ago. These are difficult to find online these days so I thought I would do my bit and re-release them back onto the scene for all to enjoy. 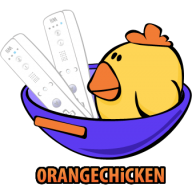 There are 271 custom injected Region Free Virtual Console game wads all by 0RANGECHiCKEN. PLEASE NOTE ~ I haven't had time to test 'every' one of these wads, but I'm almost 99.9% sure that they are all region free and will install fine on your Wii console. search through DU Forums and read up before attempting anything you don't understand. These have not been tested on vWii, I take no responsibility whatsoever for Wii console bricks, YOU HAVE BEEN WARNED. Wii systems before they are released to you. We feel it is important for people to enjoy the real product when possible. test every wad we release to make sure it meets the highest standards. VC game that exists commercially but also have room for our custom iNJECTs. they are made available to you by Nintendo. Awesome, Thanks Been forever since I have seen these!